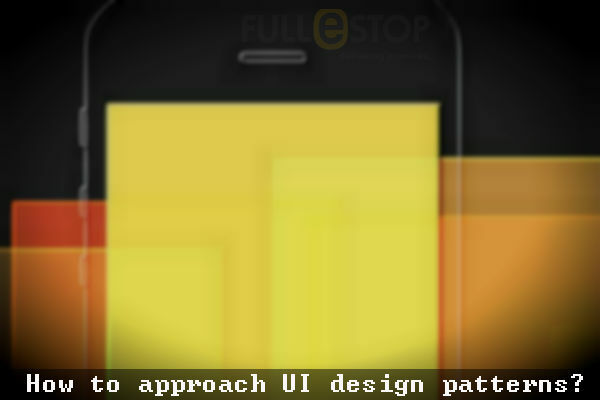 How to approach UI design patterns? HomeWeb DesignHow to Approach UI Design Patterns? Android 5.0 Lollipop: What’s new? Design patterns are probably the most optimal solutions to common design problems. Although, these design patterns are not particularly a trend in web design, they seem to be more about looking at how common designs are categorized in retrospect. In reality, we use design patterns all the time. So, if you are unfamiliar with them, you probably haven’t realized their presence around you. Consider a case of too much content to display on one page. We usually turn our attention to ‘Tabs’. This is nothing but a design pattern that enables us to serve all the content we want, without making the user lost in an ocean of links. •	It helps teach beginners how to use the best practices in web design. •	Helps adapt a collective understanding to design. •	Facilitates better communication, thereby reducing the risk linked with unfamiliar choices. •	It considerably reduces the required time and costs workflow to carry out specific tasks. •	Helps delivering a familiar user experience. Design patterns are solutions to common recurring problems. By making an efficient use of patterns, we can easily overcome simple user interface problems. Paying a close attention will help you identify patterns around you; and you will eventually realize that there is nothing special about a specific design, it’s just the way it has been applied that you get excited about. The simplest of web forms usually have a single actionable button like ‘Create Website’. The button is self-explanatory and this is the main point here. You need to serve what’s easy rather than reinvent the wheel just to stand out from the crowd. Breadcrumbs are used to show the path from the home page of the website to the current location of the user in the website hierarchy. Breadcrumb act like a form of secondary navigation and helps users understand the hierarchy or structure of the website. They start with the front page and end with the currently viewed page. Registration is quite a common thing to do on a website and it should be made as simple and fast as possible. Allowing users to register through their social accounts is an intelligent technique. If not this, you can still go with the standard registration but make sure that the process is simplified and it takes typically less than a minute. Email verification can be included as users have already got used to it. Navicon is an instantly recognizable menu icon in web design and it can be created with pure CSS. There are many variants of this navigation icon (Navicon) for a mobile browser. It is usually used to indicate a menu that can be expanded or opened. It has already been fully adapted to mobile devices and is becoming increasingly popular in modern web design. In parallax scrolling, the background moves at a slower rate as compared to the foreground. This creates a three dimensional effect as the user scroll down the page. It used carefully it can provide a nice and subtle element of depth. While in some cases, this scrolling effect is the star of the show; in others, it simply embeds a feel of depth that makes the foreground seem to pop out a little. Also, new technologies like HTML5 and CSS3 has made it possible to create more interesting and modern parallax scrolling effects. Simplicity is always the key to many design problems. A design cluttered and bloated with unnecessary elements or forms is quite a frustrating experience for users. User interface (UI) is perhaps the most important element to the success of any business or venture. UI design patterns have always been about making the site navigation easier for the user; and the best way to ensure that you design a successful site is to leverage the power of the existing design patterns.